Sounds Clever & the Valley Horns hails from the White Mountains of New Hampshire near North Conway. We play a great blend of pop and funky music that gets people moving and keeps them entertained. In addition to our always eclectic mix of cover tunes and unique arrangements of instantly recognizable tunes, we have several original songs that audiences have come to enjoy. Plus if you want jazz or swing music as a part of your event we can certainly provide that. The core band features Al Hospers on bass and vocals, Mike Sakash on saxophones, Jarrod Taylor on guitar, Michelle Boggs on trumpet and Craig Bryan, Jr. on drums. We play dance & rock music, with a heavy emphasis on R&B and and the groove. However we often start out with some funky jazz and uptempo swing music if the gig allows for it. Al Hospers - bass and vocal: Al started playing music while studying art at the University of Florida far too many years ago. 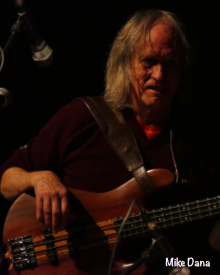 He has toured as an opening act for Tower Of Power, Argent, Canned Heat, Lynyrd Skynyrd, Elvin Bishop and more. While attending the University of Miami he performed with jazz greats such as Ira Sullivan, Louis Bellson, Stan Getz and had a rock/pop band with Bruce Hornsby. Moving to New York in the early 80's he joined a reunion group of Blood Sweat and Tears, touring the US and Europe, later joining the Buddy Rich band and touring with them as well. Moving to Boston in the mid-80's Al founded Dr.T's Music Software, a MIDI music software company that started the computer music software revolution. In 2000 he joined Harmonix Music Systems, the company that created and developed the hit games Rock Band and Guitar Hero, as Executive Producer and one of the first 6 employees. Al moved to the Mount Washington Valley with his wife in December 1997 where he stays very busy playing with SoundsClever & the Valley Horns, Bruce Marshall & the Nor'Easters and a variety of other bands when the mood strikes him! 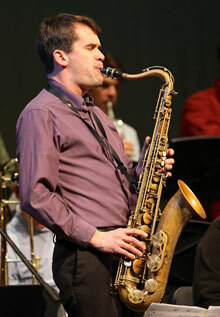 Mike Sakash - sax: Jazz, blues, funk, rock, whatever...Mike plays it all. His horns add another dimension to the funky Sounds Clever palate and allows us to play pretty much whatever strikes our fancy. He is the Director of the highly acclaimed music department at Fryeburg Academy and was 2017 Maine Music Teacher Of The Year! Mike writes and performs with the Portland Jazz Orchestra and is a highly sought after performer and arranger. We're happy to have him with the band. 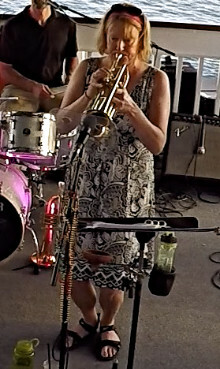 Michelle Boggs - trumpet: Michelle is a first-call trumpet player all over New Hampshire and Maine. She is always working, multiple times a week and in literally every genera. She and Mike Sakash make the perfect horn section for Sounds Clever and we're very lucky to have her as a member of the band whenever she's available. Jarrod Taylor - guitar: Jarrod Taylor is a graduate of the Berklee College of Music. He performs and records as a session guitarist in a variety of musical settings, from country, blues /rock, to jazz, classical and latin. 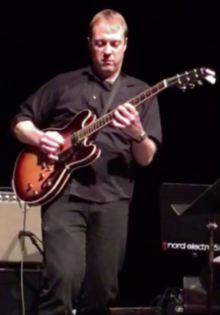 He's been part of numerous musical theater productions and is a private guitar instructor in NH. In 2017 he completed a 30 day national tour with "A day in this life", creating and recording footage for an upcoming documentary and musical release. His ability to play in almost any style makes him an invaluable member of Sounds Clever. 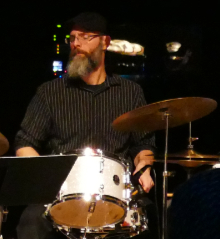 Craig Bryan Jr - drums: Craig brings a jazzy flavor and sensibility into this very funky environment and is the perfect foil to Al's bass. His energy and taste makes him an invaluable member of Sounds Clever. He has been a student of John Ramsey, Jack Maniaci, Joel DiBartolo and Dom Moio and he is a fine percussionist. He is also a music educator, running the music department in a Fryeburg Maine middle school.